21 Day Fix is an AMAZING program from Beachbody. It is not only an exercise plan, but also a clean eating program. Over 21 days, you will workout everyday for about 30 minutes a day. There is a different workout for each day of the week. Day 1 is Total Body Cardio Fix, Day 2 is Upper Fix (my absolute favorite), Day 3 is Lower Fix, Day 4 is Pilates Fix, Day 5 is Cardio Fix, Day 6 is Dirty 30, and Day 7 is Yoga Fix. Most workouts consists of several rounds of exercise that you complete for 60 seconds each and then have about 20 seconds of rest between exercises. You will also receive a set of containers and a food plan. The food plan walks you through step by step on what you may eat and how much. Depending on your weight, you will be given the number of containers you may eat per day. The red container is for proteins, the yellow for carbs, the purple for fruits, the green for veggies, blue is for cheeses & oils, and the orange for seeds and nuts. There is a wide variety of food to choose from and there are multiple recipes to be found online using the approved food! Are you looking for help and support with 21 Day Fix? Would you like to work with other women and men completing 21 Day Fix? Would you like having someone supporting you, keeping you motivated and focused to finish the program? If any of these questions are speaking to you, contact me at rockingfitbody@gmail.com. We have a challenge starting soon and we would love to have you join us! Email me today and I will get you started on your journey to health and physical fitness! Have you wondered what is the difference between Cardio Fix and Cardio Fix Extreme!? I am drenched in sweat! Although Cardio Fix is a great workout, the Extreme workout takes it to a whole new level! There is very little down time with the extreme workout. You are moving almost the entire 30 minutes. With the original you get a good 20-30 seconds between moves. By the time I was 20 minutes in, I was pretty much working on fumes. It was difficult to push through and I did not get in nearly as many reps as Autumn and her crew! BUT I finished and now I feel a great sense of accomplishment. I’m ready to tackle the day ahead. The hardest part of the workout for me was the shuffle burpees. I have a love hate relationship with burpees as it is and since the burpees were one of the last exercises I was running out of steam. My shuffle wasn’t much of a shuffle! What exercise in Cardio Fix do you find most challenging? The other major difference between 21 Day fix and Extreme is the amount of jumping. If you have bad knees you may want to make sure you are at a good fitness level before stepping up the the extreme. Not to mention after having 4 children my bladder is a wreck; jumping can be dangerous! All in all I think it was a fabulous workout and it really got my heart rate pumping. And my step count on my FitBit was at 2,917. Note that I workout first thing in morning so that is a good number for a 30 minute workout! I know I did not get that many with the original 21 Day Fix Cardio Fix workout. What is your favorite 21 Day Fix or 21 Day Fix Extreme workout? If you’re looking for support, motivation, and accountability email me at rockingfitbody@gmail.com for more information on our upcoming challenges and group support programs. Are you searching for some delicious 21 Day Fix recipes? This recipe is quick and easy! 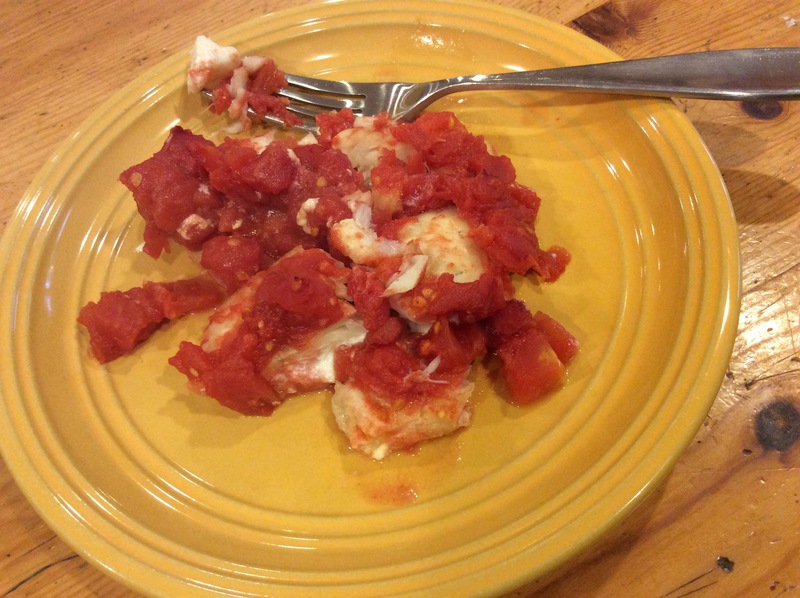 If you are following 21 Day Fix, one serving would count as a red and a green container. I don’t always have time to prepare fancy meals, so I’m working towards finding great tasting, healthy recipes. 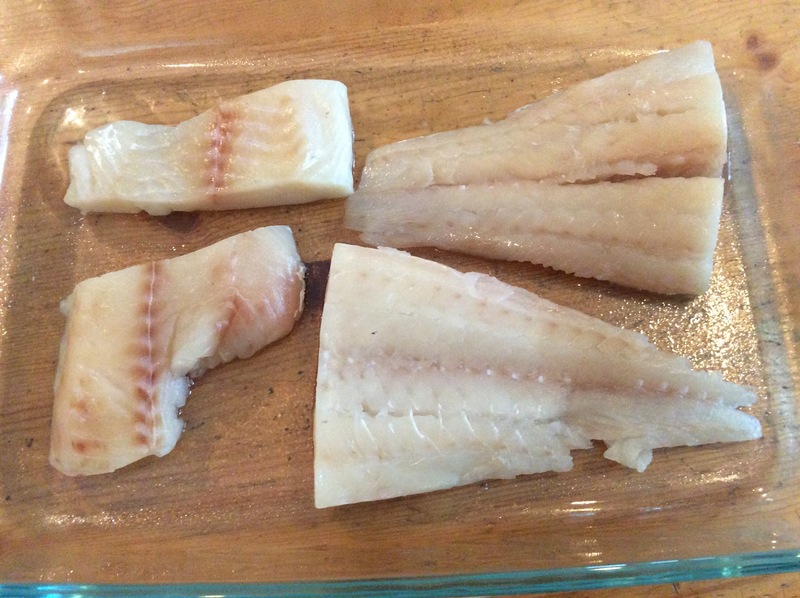 Start with some thawed fish. I used Haddock. 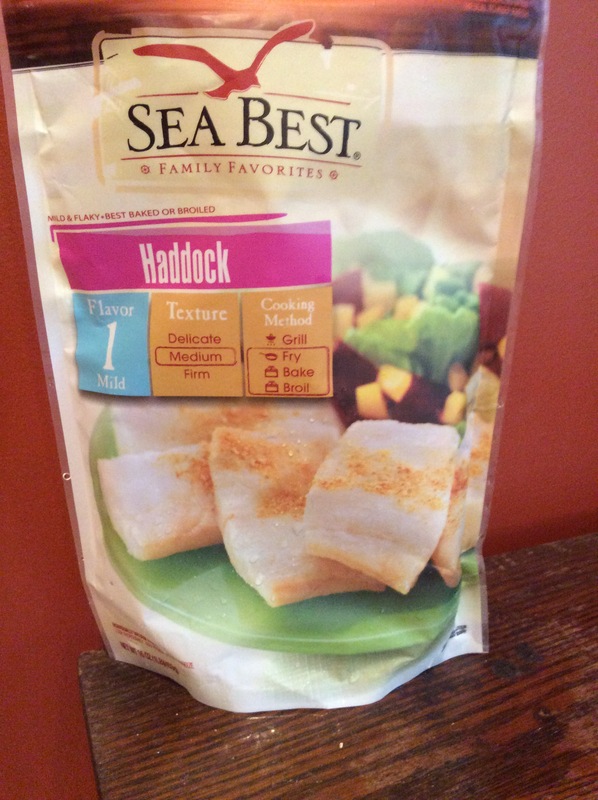 I like the individually wrapped fillets so I can prepare as little or as much as I want. Spray a glass pan with Pam. Line the pan with your fish fillets. 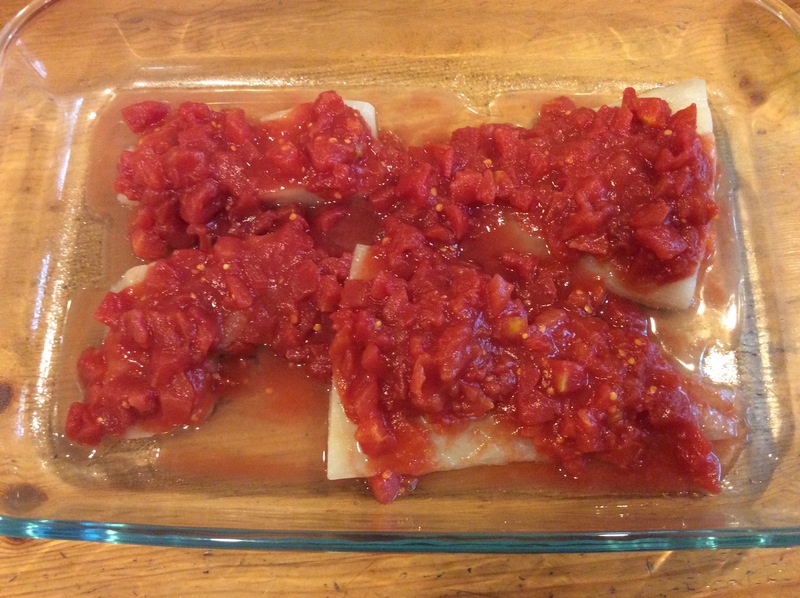 Then take a can of petite diced tomatoes with no salt added and poor on top of your fillets. Finally baked in a preheated 400 degree oven for about 30 minutes or until the fish is white and flaky. Occasionally I will serve this with some whole wheat pasta but it is just as delicious on its own! After three great rounds with 21 day fix, I lost my focus. Has this happened to you in the past? What are methods you use get back on track? What is your most successful strategy for staying on track? For me it is definitely journaling and making a weekly meal plan. I find it best to create a weekly plan and then plan my grocery shopping list. I am a creature of habit, so I basically plan the same meals and snacks each day except for dinner. This helps with prepping meals as well as snacks. And keeps my grocery bill down! Below is my meal plan for this week. I always have my Shakeology in the morning after working out! Keeps me energized throughout the day, helps curb my cravings, and it’s EASY!! So that is always my first entry in my plan. Then I plan my dinners. This can be challenging. With nine children, most of my meals need to be kid friendly. Who has time to make two separate meals!? Once my dinners are decided and containers checked off, it’s time to plan my lunch and snacks. I have foods that are my go to, ones that I always have on hand…like grilled chicken breast, baby carrots, fruits, and nuts. I use pencil to create my meal plan for the week. I use the pencil to mark off the containers and list the food choices I am planning. That way if something comes up on a certain day, I can easily re-plan. When I eat something, I write down the food with pen over the pencil, then cross of the containers with a pen. I like things to be organized and well thought out, but we all know that life happens and even the best laid plans have bumps in the road. Using this pencil/pen approach allows me to still feel organized and in control, and at the same time not get discouraged if I wasn’t able to stay on plan. Do you ever wander the store trying to figure out what you’ll need for the next few days or even just that evening?! Having a weekly meal plan also helps with grocery shopping. Having my meals planned for the week allows me to make a simple grocery list based upon my plan. I can be in and out of the store in record time. I also make it my goal to stick with the list….NO hidden items allowed in the cart! Happy meal planning!! If you are looking for more information about clean eating or 21 day fix, email me at rockingfitbody@gmail.com. 21 Day Fix ~ Group Challenge – Join Me! !